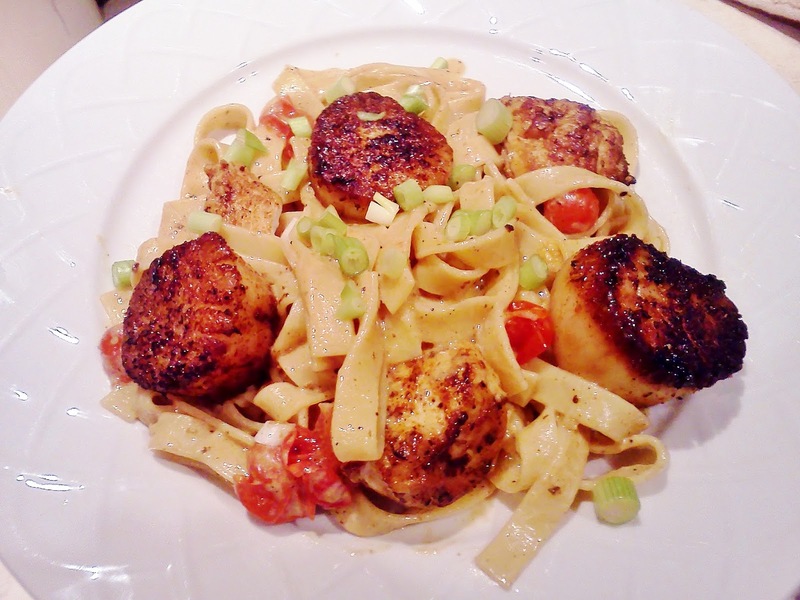 You could certainly go all scallops or all chicken, but we like to mix it up a bit around here, so I used both. Heat a large pot of salted water on high for the pasta. At the same time, rinse and pat dry the scallops and chicken. Lightly coat with a touch of olive oil and dust with about 1/2 tbsp. of SYM seasoning. Heat 2 tbsp. of olive oil over high in a large skillet or saute pan. When smoking add scallops and sear all sides well to develop a nice crust--do not cook all the way through. Remove from the skillet and reserve in a bowl holding in a 175 degree oven. Repeat the same steps with the chicken. The scallops and chicken will finish cooking in the 175 degree oven. In the same skillet add another tbsp. of olive oil, minced garlic and tomatoes remaining SYM seasoning and saute over medium heat. Place pasta in salted, boiling water and stir. Back to the skillet. Once garlic is golden add chicken stock and wine and increase heat to medium high and reduce liquid by half. Add 6 ounces(3/4 cup ) of pasta water from almost cooked pasta. The starch in the water will help thicken the sauce. Reduce again by almost half. Add half and half and al dente pasta and cook on medium for two to three minutes. Swirl in butter and parm if desired. Season with salt and pepper, sprinkle with scallions and top with scallops and chicken. *All measurements are approximations. I cook by smell and taste and I'm always adjusting to what seems right to me. That is beautiful!! Adding this to my list of recipes to make soon. Yum! This is also great with shrimp--but you have to be super careful not to overcook the shrimp. When you can't find good tomatoes, roasted red peppers would be a wonderful substitution--just add them a bit later on so they don't get mushy. Mama Done Slapped A Ball! Slap, Crackle, and Pop Ya Mamas!